If you want to guarantee a place at The Boatman, then you can book a table in the bar area or the dining room. We also have a glass conservatory with a retractable roof and heating so riverside drinking and dining is now available all year-round, whatever the weather. It’s the perfect place to enjoy the views after the sun’s gone down and we have blankets for those evenings when you want to see the sky and the stars but there is just a slight chill to the air. The Boatman is a flexible party venue offering a relaxed space for up to 80 people or for bigger parties you can hire the whole venue. We can help you organise everything you need for your event including room styling, balloons, table decorations and entertainment. We are the perfect venue for leaving-dos, office lunches, company parties, birthday celebrations, anniversaries, and family get-togethers. Our conservatory is particularly great for client hospitality and we can tailor a menu to suit your requirements. 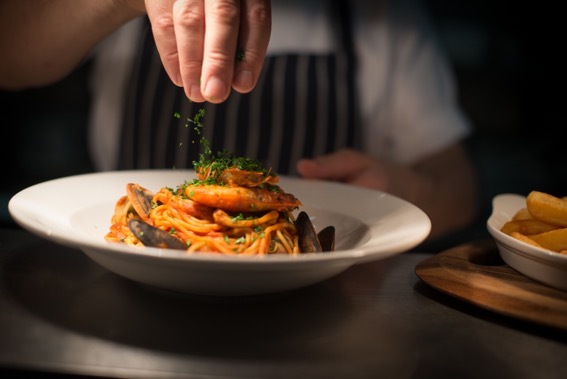 Our Head Chef has already created a selection of finger or fork buffet menus for you to choose from or we can create a sit-down meal bespoke to you. We can also cater for different dietary needs such as Gluten-Free, Vegetarian, Vegan, Jain and more, so just tell us when you book. If you’d like to discuss your event please email the team and they will be happy to chat.